At the heart of Forecaster sits its powerful prediction engine. By examining the market, analysing historical performance and studying buying behaviours it makes smarter and more accurate predictions, telling you how much you should spend to make the most profit, where to spend it and when. It plans, executes and optimises campaigns too, continuously diagnosing, fine-tuning and improving performance. Forecaster combines the best in predictive technology with a team of retail experts and world-class data scientists. 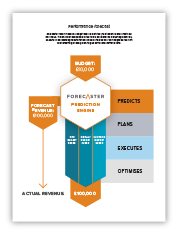 Forecaster recommends a budget and predicts the most revenue and profit you can make. It plans your spend across the three performance marketing channels, executes your campaigns automatically and optimises your campaigns so they hit your profit target and go on to give better and better results.